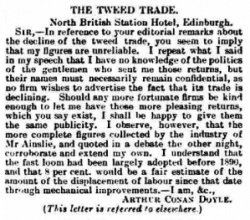 The Tweed Trade is a letter written by Arthur Conan Doyle published in The Southern Reporter, 4 february 1904. North British Station Hotel, Edinburgh. This page was last edited on 21 June 2016, at 14:00.